The Bluebonnet Tan is an 11-inch tall Women's fashion boot with vintage class. 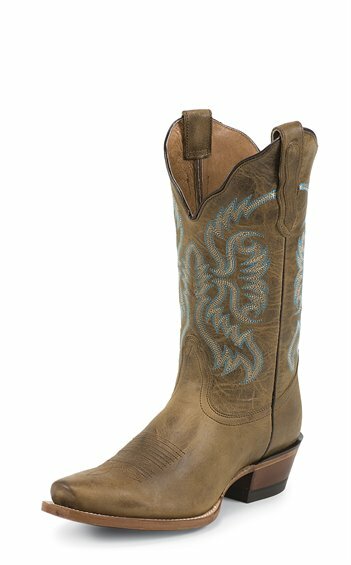 The distressed golden brown leather exterior is embellished by a light turquoise and cream stitch pattern along the upper. The narrow square toe and elevated heel add an edge and the scalloped collar provides a feminine touch. Its cushioned insole guarantees lasting comfort and support in and out of the saddle. I have had my boots for a few years now. They have lasted and maintained a good condition. I am now in need of a new pair of boots and I want the same ones! I have had these boots for a while now, and I just love wearing them. No matter the weather this is my go-to footwear for amazing comfort, and superb style. I bought these boots yesterday. The fit and balance is amazing. They feel like they were made for my foot only. Love 'em!